In the past three years, Isobar has acquired two commerce service providers, strategically elevating its offering to deliver end-to-end solutions for clients that leverage Commerce as a high value, high growth sector. These teams have joined Isobar’s global Commerce practice, a group of more than 1,000 commerce specialists across Isobar's network of 45 markets and centres of excellence. Isobar is a Global Alliance Solution Partner for Adobe, a Salesforce Platinum Cloud Alliance Partner, a Sitecore Platinum Implementation partner, and an Enterprise Magento Partner, winning Regional and Global Commercial Partner of the year in 2018. The agency has hired industry veterans to help drive the practice and the agency’s broader set of services to support experience-led transformation for clients. Shawn Mishra was named Senior Vice-President, Global Managing Partner, Isobar Commerce Practice, and Ronald Ng was hired as Global Chief Creative Officer earlier this year. 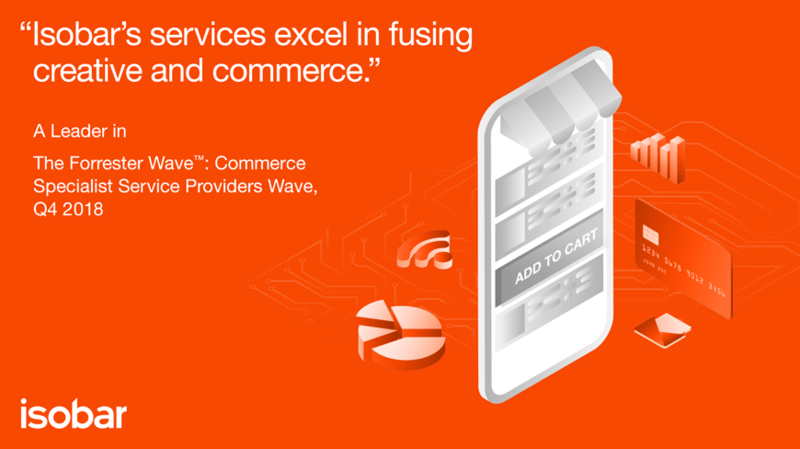 Download the "The Forrester Wave™: Commerce Specialist Service Providers, Q4 2018" report here.